Lock in a great price for Château de la Messardière - rated 9.4 by recent guests. This is our absolute favourite hotel. We have been staying here for over 15 years. The location is beautiful and quiet. The staff are amazing and nothing is too much trouble. You can go to St Tropez for the restaurants and bars and entertainment. It's only a couple of miles away and the hotel has a private shuttle for here and the beach. If the weather is not so good (which luckily in St Tropez is not often) the Spa area is lovely and the gardens and pool area are beautiful. We feel very lucky to have found somewhere we always enjoy coming back to and never tire of. The hotel is beautiful, gorgeous location, stunning land and staff are friendly. I have stayed there before and will return. by far my stay was the best hotel experience to date and I travel at least once a year! staff are so friendly and welcoming and go far and beyond to asist you and make you feel special. They are such perfectionists, thank you for a magical experience!!! Beautiful place, helping staff, nice breakfast, luxurious feeling all around. The hotel provides a free shuttle for its guests 24/7, going to town or the beach. Overall rating - Excellent!!! One of our top picks in Saint-Tropez.Château de la Messardière is 19th-century château set on the hillside. 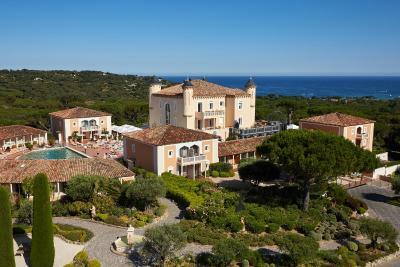 It offers panoramic views of Saint-Tropez Bay, Ramatuelle vineyards and Pampelonne beaches. It has a 465 m² spa, as well as a fitness centre, pool, hot tub and steam baths. A private balcony or garden features in all of the rooms and suites at Château de la Messardière. They each have a Italian-inspired or Provencal decoration. Breakfast is served every morning. The hotel's gourmet ‘L’Acacia’ restaurant serves Southern-style cuisine. Guests will also enjoy ‘Open Sky’ restaurant and its range of sunny dishes and light cuisine. An art gallery also features at the hotel along with a free shuttle service to Tropézina private beach and Saint-Tropez town centre. Free WiFi and free private parking are offered at the hotel. Château de la Messardiere is just a 5-minute drive from the sea and the centre of Saint-Tropez. It can be accessed by the A8 motorway or Saint-Raphaël Train Station, 21.7 miles away. Château de la Messardière has been welcoming Booking.com guests since 28 Sept 2010. When would you like to stay at Château de la Messardière? This suite has a separate living room and bedroom with a balcony or terrace. It has free Wi-Fi access, a Provençal-style decor and offers magnificent views of Saint-Tropez bay. Free Wi-Fi access and lovely views of the garden are provided in this suite. It also has a living area. Free Wi-Fi, a living area 2 bedrooms and 2 bathrooms are provided in this spacious suite. The suite features a terrace with views of St Tropez Bay. This single room features a balcony, minibar and spa bath. It is located in the adjacent wing overlooking the walkway to the central building. Guests can enjoy breakfast on the small balcony. The bed is 160x200 cm. This double room has air conditioning, seating area and spa bath. It offers views of the surrounding countryside and the entrance to the hotel. This double room features a balcony, air conditioning and sofa. It offers views over the countryside and the Ramatuelle vineyards from the balcony or terrace. This double room features a minibar, spa bath and sofa.It is located next to the pool and opens into the hotel gardens and vineyards of Saint-Tropez. This double room features air conditioning, bathrobe and seating area. It offers a large private terrace for sunbathing and views over the bay of Pampelonne. House rules Château de la Messardière takes special requests - add in the next step! Château de la Messardière accepts these cards and reserves the right to temporarily hold an amount prior to arrival. Guests are kindly requested to ensure that children are accompanied in the public areas of the hotel including the pool area and restaurant. The room was too hot and couldn't be altered. This meant we found it difficult to sleep. Far too expensive for the size of the room and quality of fittings. We have been coming back to Chateau de la Messardière and it is a beautiful hotel in a great location to explore St. Tropez and the area. But what really sets it apart is the exceptional service. It’s starts from the receptionist knowing your room number, the service of the fleet team or the attentiveness of the pool staff - it’s the small things, but they do them so well. We always feel so welcome there and will be back for sure. The beach club the hotel is affiliated with doesn't seem to be special in any way. Besides being able to charge things to your room, there was no benefit in going to their partner beach club. Beautiful hotel with impeccable service. The food was amazing as well. Great location. Room was a little on the warm side, because AC had been turned off for the cooler season approaching. Over the top friendly service-checkin was a breeze and concierge full of truly enjoyable recommendations; from its beautiful and restful grounds, there's an astounding view down to the sea; hotel shuttle takes guests into old village to explore its wonders or to the 3 mile long sandy beach with a multitude of lunch options; breakfast on the terrace was delicious and served with smiles; the pool invites you to linger on a lounge. Wish we could have extended our 4-day stay. Pools were heated but not enough to go in while it was a bit cold outside, breakfast was OK - missed some vegetables. other than that - JUST PERFECT!! !